It's time to put the "party" back in "Halloween party." But how to do it? So many of those ghouls, goblins, and ghosts are always stealing the show with their bad, creepy vibes. Sometimes it seems impossible to compete with them, doesn't it? But might we make a suggestion? You probably banana labels... or certain Latin American entertainers of the 40's that really knew how to light up the room. Wherever they went, the party followed. 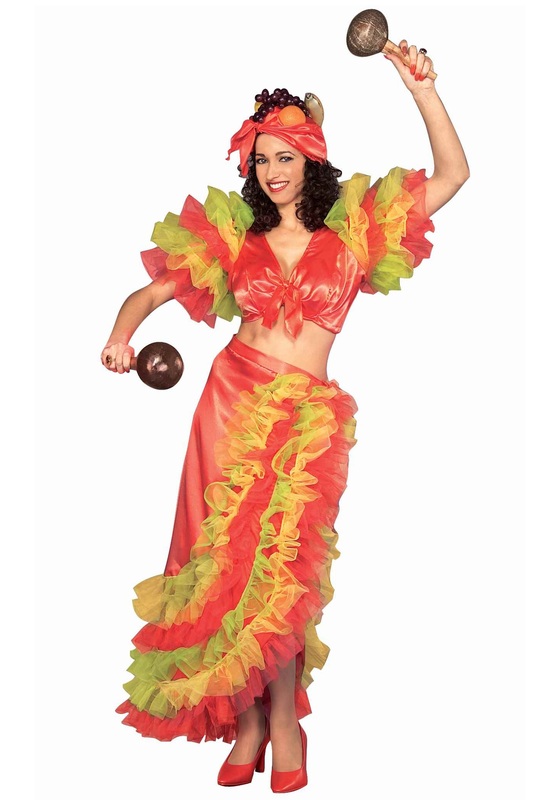 This dress captures that classic flamenco-dancing spirit and festive South American vibe perfectly. That's why you'll be the life of the party In this beautiful Latin Dancer Costume! Covered in brightly colored frills and fluffy tulle fabric, this outfit was made for spinning on the dance floor, with or without a partner. The dress includes a bouncy, shapely skirt with an alluring side slit tastefully exposing the leg and a top that lets you show off your midriff as well. And the proverbial cherry on top is the hat. It's decked out with a nice little collection of tropical fruits. It's a fashion statement you don't see too often anymore, so you'll turn heads when you walk into a room with it. As if that weren't enough, a sprinkling of glitter across the hat will help it -- and you -- truly shine in any light!